With two professors, one lecturer, seven postdocs, and further colleagues, the Section Biodiversity, Evolution and Ecology of Plants contributes significantly to the teaching of the Biocenter Klein Flottbek. The classes offered cover a wide range from basal courses at the BSc. level to advanced courses at the MSc. level. 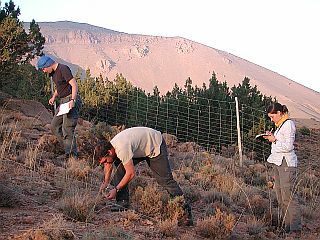 Major topics are systematics/evolution and determination of various plant taxa, vegetation-, landscape- and macroecology as well as ecological statistics. There is also a weekly paper-writing seminar for BSc.-, MSc.-, and Ph.D. candidates in English/German.